Old-fashioned, soft, spicy Hermit cookies have never really gone out of style, but they certainly could use a make-over. Here is an updated version designed to meet today’s taste for cleaner, brighter flavors and textures—with less fat and more fiber. 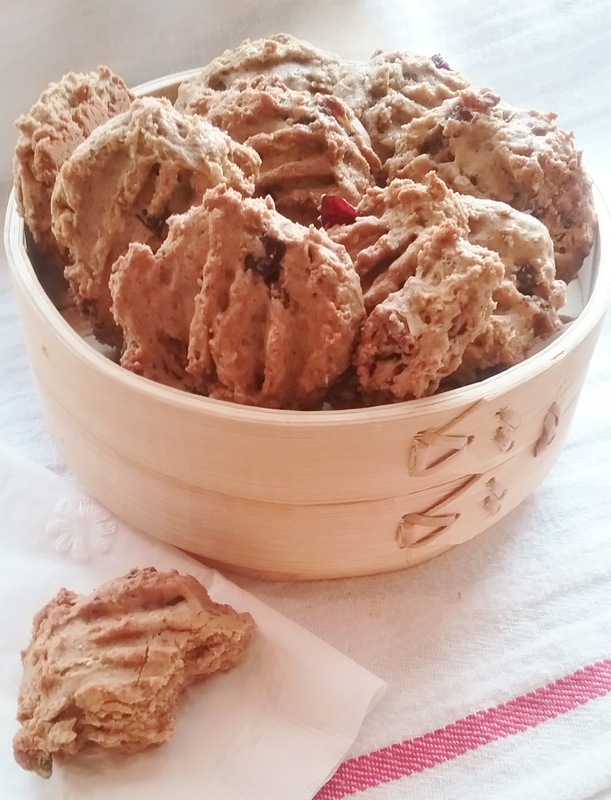 It is my latest go-to cookie because it lasts well, is very tasty, and nearly foolproof to make. 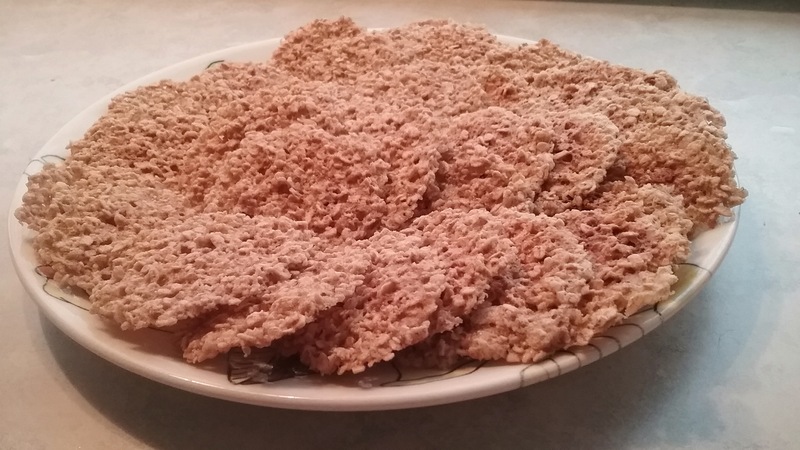 I call it my formula cookie because it can be easily varied, depending on need, mood, and availability. For example, the 2 cups of flour can be replaced with nearly any type or combination of flours. For best rising, I tend to use a base of at least 1 cup all-purpose flour. Any variety of dried fruits and nuts will work, I especially like to include dates because they are meltingly sweet and moist. The ingredient variations listed below are a recent favorite, but don’t let that stop you! The warm spices of cinnamon, coriander, and ground ginger are an excellent combination that works well with a variety of dried fruits and nuts, especially dates, dried cranberries, and a few pumpkin seeds. This cookie is easy to assemble and best of all, it requires only one bowl. The fairly heavy dough comes together very quickly, yielding a soft cookie when baked. Best when not overcooked, plan on about 10 minutes per batch. Store these airtight at room temperature for a week or longer. Preheat oven to 375°F. Line baking sheet with silpat or parchment. On waxed paper, sift flour through salt; mix in the oats, add the dried fruit, nuts and toss to coat. In mixing bowl, whisk egg and oil together, whisk in the brown sugar and milk, then the vanilla. Stir in dry ingredients with large spoon only to combine, it will be thick. Using a small scoop or form rounded teaspoons of dough and roll into balls, place 2″ apart on baking sheet. Flatten with a moistened fork while rounding the edges. Bake 9-11 minutes, until barely set and the tops begin to brown. They should be soft and seem undercooked; they will firm up as they cool. Cool on rack and repeat. Yield: 27 cookies. Grain bowls. Lately I’ve been inspired by the idea of stacking food delicately into a small, fetching bowl. At its heart, a healthy grain or rice forms the base, then a good dose of well-flavored vegetables are arranged atop, with a smaller amount of protein tucked in for a balance meal in a bowl. The concept hits all the right notes, it’s quick and easy. A bowl holds less food than a plate, and it’s a great way to round up a flavorful meal with odds and ends—or leftovers, in some circles. Of course the creative license to mix and match at will is powerful. There are no rules. Better than that, break the rules! The key to the grain bowl’s success is to have a supply of pre-cooked rice or a grain such as farro, barley, or quinoa ready to go. For example, spoon a healthy amount of your grain or rice into a small, tall bowl, top with a generous handful of a pre-mixed blend such as spinach, pak choi, and mustard greens, fill in with a poached or fried egg to break up, much in the manner of a sauce. Finish with some fresh herbs and a big punch of flavor, the likes of harissa or gochujang. This past weekend I was on fire, filled with the anticipation of throwing together my own grain bowl. A little low on supplies, I had only millet, but it was a fine start when simmered with a dash of turmeric and a bay leaf. Mostly, I was excited to take advantage of my latest rhubarb chutney, waiting for its own 15-minutes of fame. At the farmers market I picked up a couple of beautiful zucchini and a few gorgeous carrots, a nice combo for a quick veggie add-on. In the fridge I had a small pork tenderloin. This was coming together more like a banquet that a small meal in a bowl. But, it’s the weekend! When dinnertime rolled around I was running late, getting very hungry, and certainly glad this was going to be a fast, easy meal. The pork was quickly rubbed with olive oil, Moroccan spice, salt and pepper. I gave it fast sear and popped it in a 400° oven for about 25 minutes. While that was happening I deglazed the pan and made a quick sauce flavored with harissa. The zucchini and carrots were quickly sliced into ribbons, tossed with a few drops of sesame oil and garam masala. Opa! We’ve got big flavors everywhere! About 5 to 7 minutes before the pork was done, I added the veggies to the roasting pan and tossed them lightly with a little of the pan juices. Once out of the oven, the tenderloin was tented for a few minutes to rest before slicing. I had just enough time to pull it all together. It was then, that I was faced with the truth. A charming, small bowl would not do justice to the fine collection now waiting to be plated—or bowled, if that is a word. This was worthy of a pasta bowl, of the first order. Facing reality, I spread the thinnest possible layer of millet into the bottom of the bowl. One of the grain bowl rules is to use more vegetables than protein. I smartly swirled a portion of the zucchini and carrots across the millet, allowing for three lovely medallions to arc around the corner, and finished the pork with a drizzle of the harissa sauce. Rounding out the bowl, a small handful of spicy Asian greens became a mere place holder for the honored rhubarb chutney—and of course, a sprig of cilantro. Good news! No heartburn, or negative reaction to the epic grain bowl. Delicious, all of it! For the millet, combine the millet, the turmeric, bay leaf, salt and water. Bring to a boil, cover, and simmer for approximately 35 minutes, until water is absorbed. Set aside to cool. For the pork, rub the pork with olive oil, then with Moroccan spice, salt and pepper. Heat a large skillet with coconut oil over high heat and sear pork on all side, about 5 minutes. Remove to baking pan and roast at 400° for approximately 25 minutes. For the harissa sauce: deglaze saute pan with ½ cup of the beef stock, let it cook down briefly while scraping the bottom of pan. Add the remaining ½ cup stock combined with 1 teaspoon cornstarch. Add the harissa sauce and let reduce. Taste for seasoning add salt and pepper as need. Keep warm. For the vegetables: using peeler or spiralizer thinly slice zucchini and carrot into long strands. Toss with sesame oil and garam masala. About 5-7 minutes before pork is done, add veggies to the roasting pan. Toss with the pan juices and heat. Remove the pork and veggies, tent with foil and allow to rest briefly while preparing grain bowl. To finish: re-heat the millet and spoon into the bottom of bowl. Spread vegetables over half of the top. Slice the pork into ½” or thicker medallions. Nestle in the pork and drizzle with a little of the harissa sauce. Add a small handful of greens and top with a dollop of Rhubarb Chutney. Add a sprig of cilantro and enjoy. Yield: 2 or more servings. I received a new gadget for my birthday. Actually, this unit is beyond any gadget previously known to man. For some, the latest Instant Pot could represent a state-of-the-art crockpot. To others it’s a digital pressure cooker, or a reliable rice cooker, a steamer, or a sauté pan. In fact, it does all of that and much more—with precision and ease. No, I’m not being paid to review or promote the Instant Pot, I am just another huge advocate of its approach to sustainable and healthy cooking. My 5-quart pot uses only 900 watts of electricity. In comparison, if you’ve analyze other appliances in your kitchen, you know that a toaster can easily burn up 1800 watts. 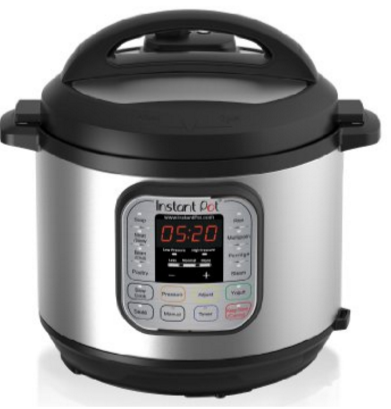 In the Instant Pot’s many digital cooking applications the real turning point for me was the realization that I could brown or sauté vegetables or meats before launching into slow cook or other modes. 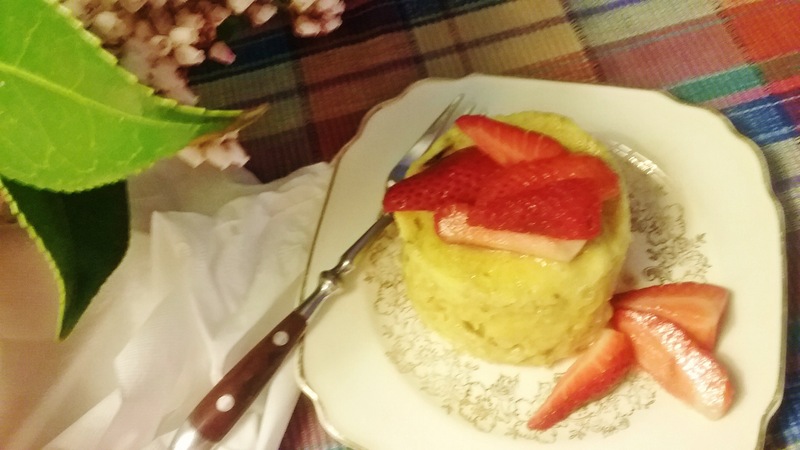 I have shared a number of wonderful slow cook recipes here, and my sole reservation to crockpot cooking has been that without the browning of meats and vegetables dishes can become one-dimensional. The luxury of combining the browning step into the slow cook method opens up all sorts of possibilities previously unavailable in most models. On the pressure cooking side, I was relieved at the fail-safe measures built into the system. Following simple directions, even the quick method of releasing steam is safe and near foolproof. Now, I often use the very fast pressure cooking method as a highly convenient option, without angst or intimidation. For the tiny kitchen, the Instant Pot is paramount to having an entire stove top and a fleet of pots and pans available for daily cooking needs. It can be used to simply simmer or boil as you would on the stove. The heavy duty stainless steel liner is easy to clean, and it is of course dishwasher safe. 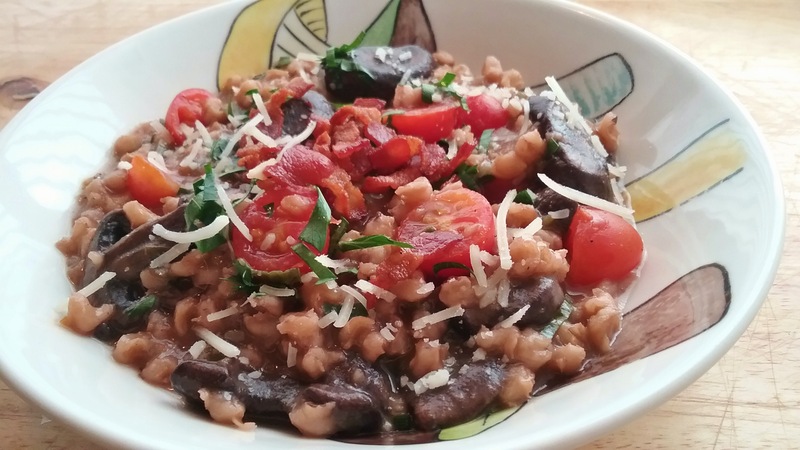 One of my first attempts at tackling the Instant Pot was to prepare a lovely barley risotto of sorts. In this case the barley was pre-cooked, allowing for an easy 1 hour slow cook. Delicious on its own, it became the backdrop for Stuffed Cabbage Rolls. Heat the pot to sauté medium, brown the bacon in a drizzle of olive oil and remove. Add the shallot and cook to soften, then add the herbs and stir until aromatic. Add a portion of the beef broth, stir to deglaze the bottom the pan and loosen any surface bits. Add the barley and the remaining broth, stir to combine. Bring to a simmer. Reduce to slow cook medium and cook covered for an hour, until the barley is creamy and thick. Note: to pre-cook barley, allow 1:3 ratio barley to liquid. Bring to a boil, cover and cook 35 minutes. If you are looking for ways to add more salad to your life here’s a fun, make-ahead solution that even includes its own dressing! 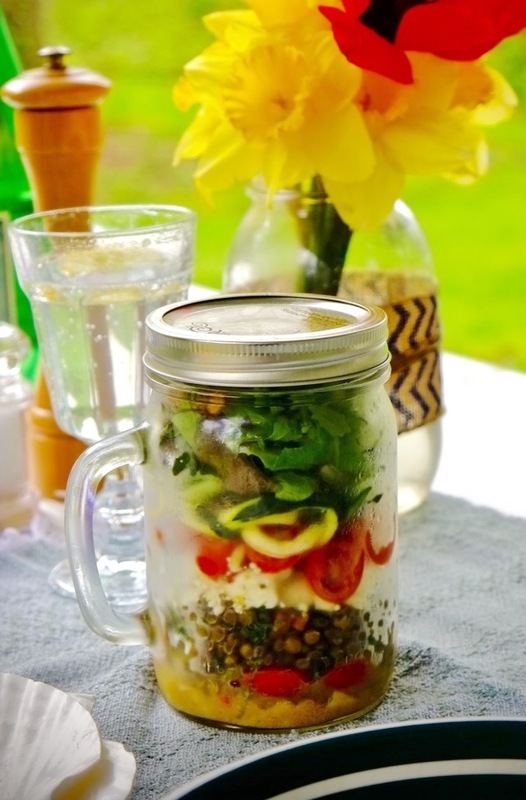 Pull out a wide mouthed Mason jar, pour in a little salad dressing, then pack in ingredients—layering heavier items on bottom and ending with more fragile vegetables and lettuce on top. While at it, make a few extra to pull out as needed; they will hold several days in the fridge without lettuce becoming soggy. The star of this salad is the nuanced peppery le Puy lentil, a firm, dark green variety that holds its shape very well. They can be found in better grocery stores and in most bulk food sections; but if not available substitute garbanzo beans. Radishes, fennel or celery are all excellent salad companions here, along with contrasting narrow strips of young zucchini. At the base of the salad dressing, a spicy or grainy mustard not only provides a bright bite, it also acts as an emulsifier to bind the dressing from separation while it stands. 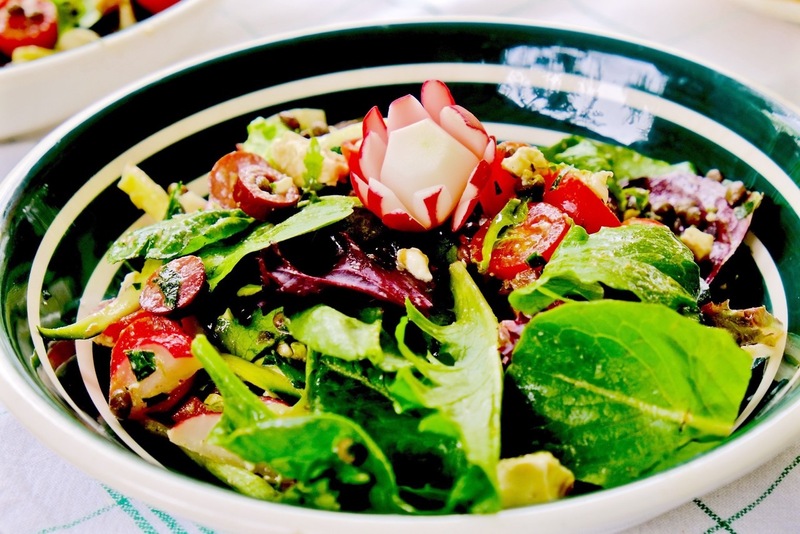 When ready, give the salad a good shake and empty contents into a pasta bowl or other wide bowl. Toss well to distribute dressing and enjoy. To prepare dressing, combining vinegar, mustard, thyme, salt and pepper, then add the olive oil and whisk or shake until thorough incorporated. In a mason jar pour in 2 to 3 tablespoons dressing. Pack ingredients in individual layers in the order listed. Substitute similar items as desired, placing heavier, denser on bottom, followed by beans and proteins, then softer ingredients, and finish with lettuce or sprouts. Serves 1. 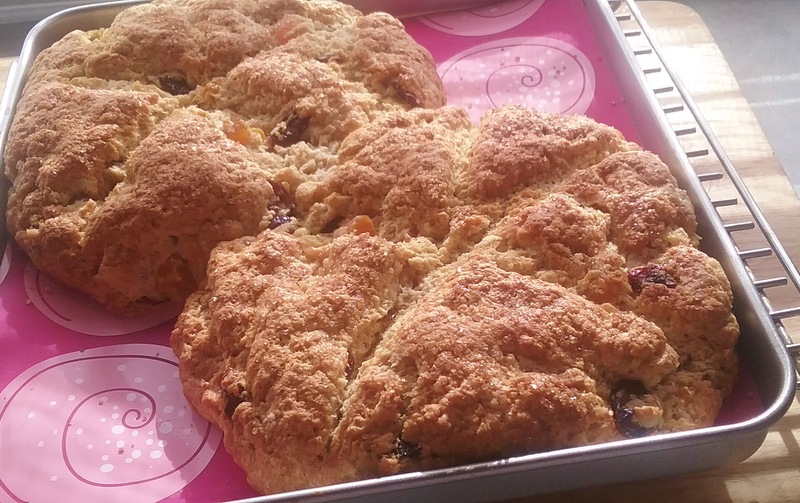 Scones: fresh from the oven! Blueberries are outstanding in these scones, but they also worthy of Oregon’s Marionberries or even pitted cherries. In this batch I’ve substituted ¾-cup whole wheat flour for ¾-cup all-purpose flour, and for fruit, dried cranberries and apricots. Dried fennel, other herbs and spices are obvious additions, whether in lieu of fruit or as a complement. Scones are a snap to make with a food processor, but I have made them using 2 knives to cut the butter into the flour—much like making a pie dough. Beyond that, it’s a simple matter of stirring the liquid into dry and forming the dough into two loaves, with the least amount of possible fuss. 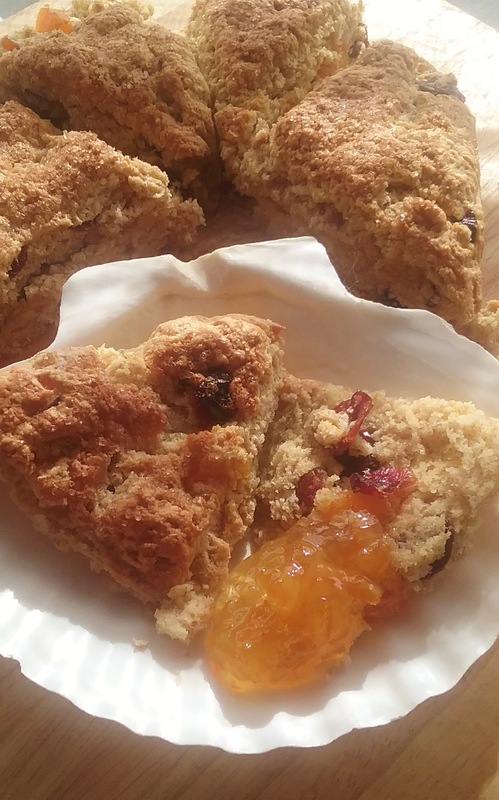 The secret to light scones is minimal handling and a moderately hot oven for fast rising. To do this, quickly form into two rounds and score the tops—instead of shaping individually. Cool briefly before slicing into portions and enjoy hot with butter, jam, or straight up. Store whole loaves lightly wrapped, reheat, and cut to order. For more ideas, check out the variations that follow. Butter a baking sheet or line with silpat. Preheat oven to 375°. In a mixing bowl sift the flour through salt. Using a food processor or 2 knives, cut the butter into flour mix until it becomes a grainy texture. Make a well in the center of the butter-flour and pour in the egg-milk liquid. Stir briefly to bring ingredients together and fold in fruit or other additions if using (details below). Turn out onto a floured surface and lightly knead if shaggy and form a round. Divide mound in half and pat into 2-6″ rounds, about 3/4″ thick. Mark the tops into 5-6 wedges with a sharp knife. Place on a greased sheet. Brush the tops evenly with milk and dust with sugar. Bake at 375° approximately 20 minutes, until golden brown. Yield: 10-12 scones. Dust the berries with flour and cinnamon. Gently add to the flour-fat mixture after the egg-milk liquid. Proceed as directed. Score each round into 6-8 wedges. Dust thumb with flour and press down into middle of each section, making 1/2″-3/4″ wide hole. Fill each impression with favorite jam (about 1/4 cup total). Brush with milk, sprinkle with sugar and bake. Serve hot. I should have known better. I did not expect much, and I was wrong. Maria Speck’s book Ancient Grains for Modern Meals has been a reliable resource in my kitchen for quite a while now, and it has rarely let me down. It’s one of those recipes I have considered on several occasions but moved on, opting for something else. Perhaps it is because she offers it as primarily a breakfast dish—and it needs an overnight soak. Apparently, I have trouble thinking that far ahead. Sad. Maria calls it an Anise Oatmeal Puff. That sounds interesting. But then she adds an egg, clearly something I’ve had difficulty imagining. Well, for anyone who is a rice pudding fan, take another look. You receive all the instant gratification, plus it’s made more nutritious with oats. Maria and her family must surely like it, because her recipe makes enough for 8 stand-alone servings. This morning I decided to test her idea. I would resize the dry mix and forgo the prescribed overnight soak method. 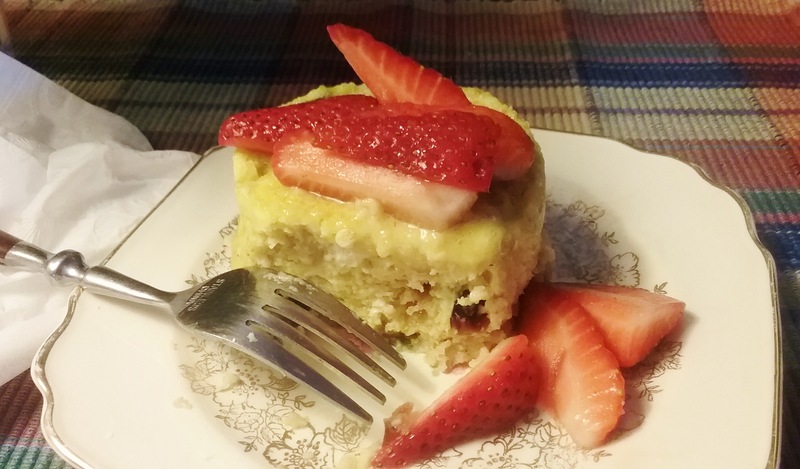 It’s another microwave wonder: true bliss in under 5 minutes. Tasty, filling, entertaining, and fast. In fact, I would even make this for dinner—or dessert—and forget dinner. In all fairness to Maria, I offer her original recipe from sister book Simply Ancient Grains, because it is probably worth making in batches and investing in the overnight soak. However, if you are like me, and in your first excursion would prefer to pass on the wait, those adjustments also follow. Prepare the dry oatmeal mix and combine well. Store airtight. The night before: In microwave safe mug or bowl place 1/3 cup dry oat mix with milk, syrup and vanilla. Cover and chill. The next morning: In a small bowl beat the egg with a fork until well blended. Stir it into the mug mixture to combine. Stir in 3-4 grapes or other fruit. Place mug in microwave and cook on high 1 minute 20 seconds – it will rise possibly above the rim, but will not spill over. It is done when a skewer inserted comes out clean. Cook 10 seconds and test. Let set a few minutes to firm up. Top with more grapes, dust with cinnamon and serve. 1 tablespoon dried fruit: cranberries etc. To expedite soaking, warm mixture in microwave for about 40 seconds, stirring every 20 seconds to absorb some of the liquid and expand the oats, but not thoroughly heat. Beat 1 egg and incorporate in the oat mixture. Microwave a total of 1 minute and 20 seconds. Half way, rotate the cup for even rising. It is done when a pick or narrow knife inserted in center comes out nearly clean. Let rest about 3 minutes to set up. Top with a few fresh berries. If desired, sprinkle with powdered or cinnamon sugar. Well, that was exciting—but of course, food does that to me! 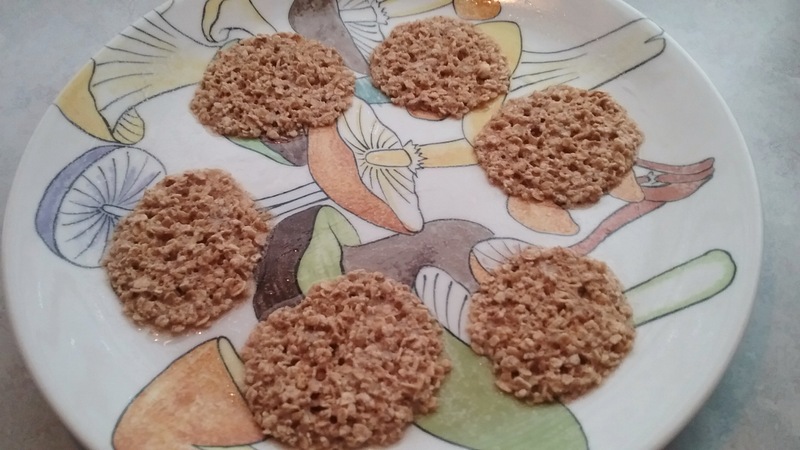 Oatmeal crisps, tuiles, wafers. It’s all good. This time two of my favorite things, oatmeal and caramel, joined together as one, thanks to the magic of the microwave. My tiny kitchen was astir with activity while these beauties danced their way out of the oven, one sweet nutty batch after another. The crisp golden cookies began as tiny ½ teaspoon droplets of batter then immediately melted and expanded into thin rounds; they were done in less than 2 minutes of rapid baking. The trickiest part here is figuring out how to rotate from one batch to the next without a lot of down time. When I hit my groove I was filling, turning, or cleaning two oven safe 10” flat plates constantly. Well, that’s not completely true. There was a time when I looked a little like Lucy in the chocolate factory, tasting and sampling the goods as fast as I could. In spite of that, once the assembly line was working and I had my rhythm going, I cranked out four dozen cookies (*less the sample factor) quite efficiently. It could be remnants of a sugar high, but these are dangerously addictive. Fair warning. Sift the flour, baking powder, and salt and combine with the oats. Add melted butter and dry ingredients and stir well. Thoroughly coat a 10″ round ovenproof platter with cooking oil. Drop 1/2 teaspoonful rounds of batter onto platter in a ring about 2” apart, around the inside rim (will only make about 6 cookies per batch). In the microwave, bake first batch approximately 2-1/2 minutes. Every 30 seconds, stop and restart until cookies begin to bubble and centers turn lightly golden. They will firm up as they cool. Cooking time will shorten with remaining batches: allow about 1 minute 20 seconds depending on oven, restarting every 30 seconds to cook evenly. Watch carefully—they will burn quickly. Remove with metal spatula to a rack to cool. Store airtight. Yield about 4 dozen cookies. Batter can be made a day in advance, chilled and well covered.